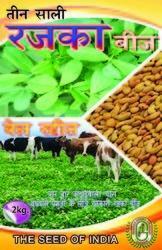 Manufacturer of a wide range of products which include cattle feed seeds. We are engaged in offering our valued clients supreme quality Cattle Feed Seeds. The offered seeds are processed using sophisticated technology in line with the set quality norms under the vigilance of adroit professionals. Our provided seeds are hygienically packed to maintain their freshness intact for long time. Furthermore, we offer these seeds to our patrons in various packaging options at pocket friendly prices.